In traditional medicine, lady’s mantle has been used for female ailments, including various gynecological disorders (heavy bleedings, irregular menstrual cycle, endometriosis, cysts, myoma, uterus prolapse, genitourinary infections, etc.). It has a tonic effect on uterus muscles, and it has traditionally been used for the prevention of miscarriage, or for strengthening the muscles after a miscarriage, delivery or abortion. It has also been used for the treatment of infertility, in the combination of other plants, such as vitex (Vitex agnus castus L., Verbenaceae), etc. It also helps with problems during menopause. Lady’s Mantle Tincture is a 100% natural, organic product, made on the base of the extract of lady’s mantle herb, (Alchemilla vulgaris L., Rosaceae), extracted by organic fruit distillate. It is a potential natural remedy, owing to the complex of herbal ingredients (tannins, flavonoids, bitter components, saponines, etc.) The name of the plant indicates its soothing effect – Lady’s mantle or Frauenmantelkraut. Lady’s mantle has been traditionally used and its properties have been experimentally confirmed: adstringent, antihemorrhagic, antidiarrheal, antiviral (HPV), spasmolytic and uterotonic. Lady’s mantle extract shows strong antioxidant action and inhibitory effect on tumor growth, owing to the interactions of tannins with the proteins on the surface of the cell. 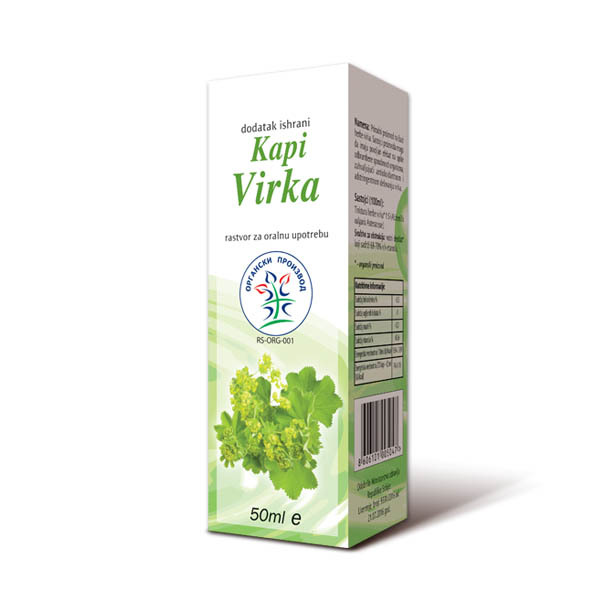 It has positive effect on various gastrointestinal disorders, gastritis, gastroenteritis and atypical diarrhea and it is also a good diuretic, increasing the excretion of fluid from body. Package – a 50 ml bottle. Adults and children above 12 should take 1,5ml (around 90 drops) with water or tea, 3 times a day, between meals. The product was approved by the Ministry of Health of the Republic of Serbia: certificate no 9331/2016, since July 21st, 2016.